During press previews, Honda revealed the 2017 Honda Ridgeline, their versatile midsize pickup truck. The newly redesigned addition to their light truck lineup was designed and developed by Honda R&D Americas and will be produced at the Lincoln, Alabama facility. The new Ridgeline boasts superior handling due to its unibody construction, sophisticated chassis, and available i-VTM4™ torque-vectoring AWD system, and tons of space with the largest and most versatile cabin and the In-Bed Trunk™, the only 4-foot-wide flat bed space in the midsize pickup segment. Other innovative features include: a dual-action tailgate and the industry’s first in-bed audio system, 8-inch Display Audio featuring Apple Car Play® and Android Auto™ compatibility, and a veritable suite of top of the line safety features. The Ridgeline mates a 3.5-liter, direct-injected i-VTEC™ V-6 engine to a 6-speed automatic transmission to providing refined powertrain, and will target best-in-class acceleration performance and segment-leading EPA fuel economy ratings. All-wheel-drive models will utilize Honda’s i-VTM4™ torque vectoring AWD technology, featuring Intelligent Terrain Management with Normal, Sand, Snow and Mud modes, which provide robust off-road and towing capabilities in all conditions. The Ridgeline aims to challenge conventional thinking in the pickup truck market with Honda-exclusive features, design and technology in a midsize pickup. In addition, Honda’s luxury division Acura unveiled the global debut of the Precision concept model, developed by the Acura Design Studio in Torrance, CA. Acura also took advantage of the press previews to introduce their “Precision Crafted Performance”—a core ideal that is embodied by the new Precision concept—just in time for Acura’s 30th anniversary as a company. said Dave Marek, Acura’s global creative director. The design concept for the Precision expresses the very DNA of “Precision Crafted Performance” through its ultra-low and wide athletic stance and long dash-to-axle ratio, and emphasizes high-contrast details like the intersection of modern, sheer surfaces and muscular, organic sculpting. 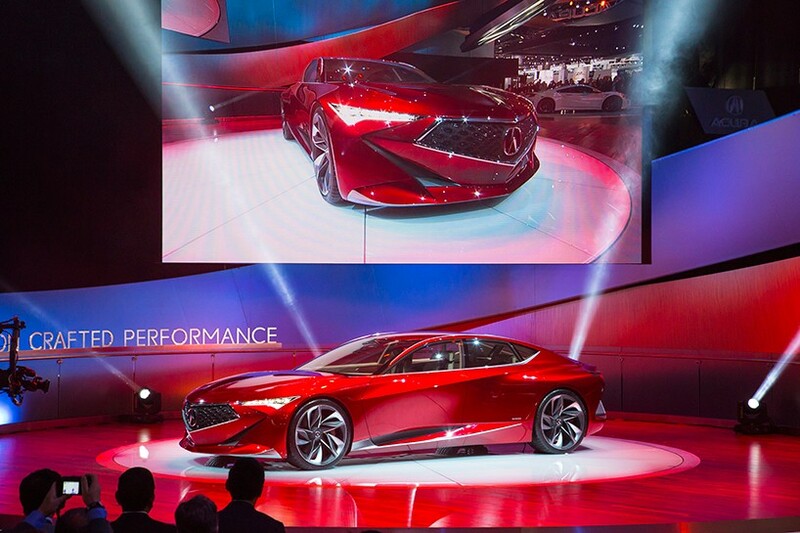 A key design theme, dubbed “quantum continuum,” is seen in the organic transition of materials and structure from the exterior to the interior of the vehicle, from the debut of a new Diamond Pentagon grille and a fractal re-envisioning of Acura’s signature Jewel Constellation LED headlights, to floating rear seats and audio speaker grilles hand-crafted from exotic wood. This collaboration of exterior design by Michelle Christensen, principal exterior designer, with interior design by John Norman, principal interior designer, also played a key role in the creation of the next-generation Acura NSX supercar. Superior features of the Acura Precision include a driver’s space dominated by a sporty steering wheel with paddle shifters and Integrated Dynamics System (IDS) controls, and Acura’s digital human-machine interface (HMI), enabling a nearly sci-fi level of connection between man and machine. The intuitive system actually scans each occupant and selects personalized features and functions, including maps, audio, and customized vehicle performance settings. said John Ikeda at a press conference on January 12th. Ikeda is vice president and general manager of the Acura division of Honda North America. Acura executives expressed a firm conviction that the Precision Concept and the new 2017 Acura NSX that hits the US market in the next few months (pre-orders open February 25th) will set the benchmark for the “Precision Crafted Performance” gold standard for years to come. Attack on Titan: Is the Apple Car Project in Trouble? Error - Error validating access token: Session has expired on Tuesday, 06-Feb-18 09:00:00 PST. The current time is Thursday, 25-Apr-19 13:17:39 PDT.